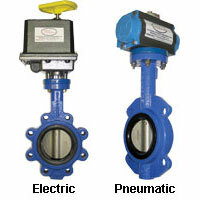 The Series MGO Gear Operators offer heavy-duty on-off or throttling service for valves or dampers, including our BFV Series butterfly valves. These gear operators are self-lubricated for smooth, trouble-free operation. The rugged, cast iron body with O-ring body seals is weatherproof. 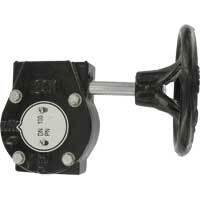 A self-locking worm and worm gear holds the valve in the desired position. Features include a readily accessible hand wheel, a valve position indicator and mechanical travel stops that permit field adjustment for valve movement to specific degrees of rotation. When choosing a gear operator, make sure that the input/output specifications meet those of the chosen valve's requirements. To determine the input torque, divide the required torque of the chosen valve by the mechanical advantage of the appropriate gear operator. Once the input torque is known, the hand wheel rim effort can be found by dividing the input required at the nut divided by the radius of the hand wheel. 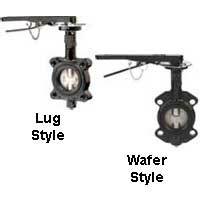 Cast iron housing, hardened steel internals, NBR seals. 2 to 6": 24:1; 8 to 10": 30:1; 12": 50:1. 2 to 6": 6.72; 8 to 10"; 8.1; 12": 13.5. MGO-1T, MGO-2T, MGO-3T: 11.5 lb (5.2 kg); MGO-4T, MGO-5T: 28.6 lb (13 kg); MGO-6T: 33 lb (15 kg).